This is the classic version of "Krippu". 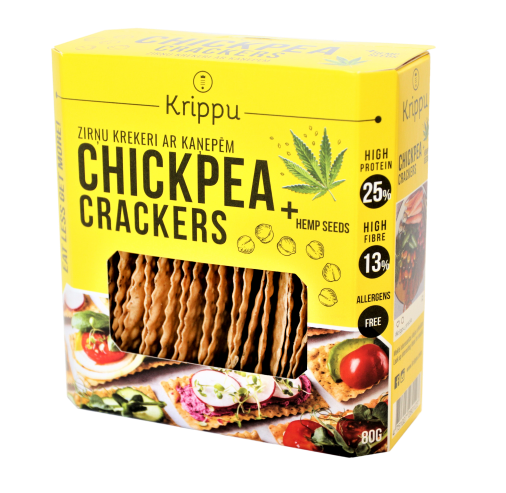 Chickpea crackers will serve as a great alternative to bread, rusk or galletes, which are gluten-free , high protein and fibre. Ingredients: chickpea flour, linseed 4%, sunflower seeds, hemp seeds 1%, cumin, salt, oregano, pepper mixture. 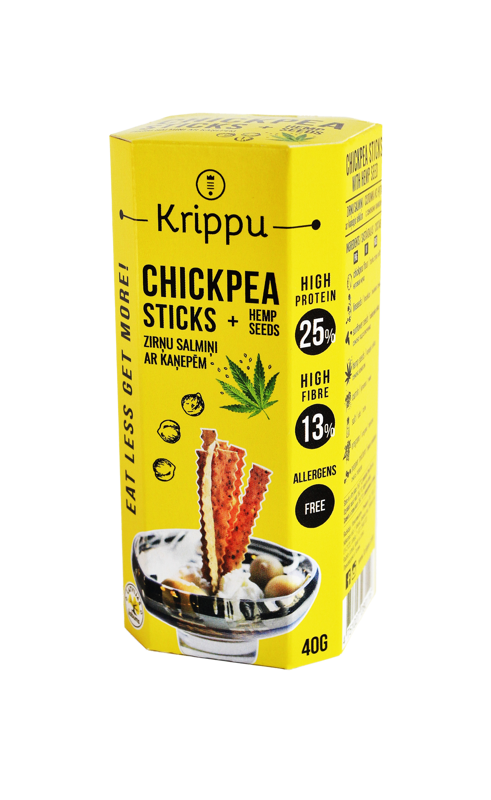 "Krippu" sticks will be useful in situations where there is an urgent need for a snack – they are delicious and healthy alternative to salty snacks, cookies and chips. 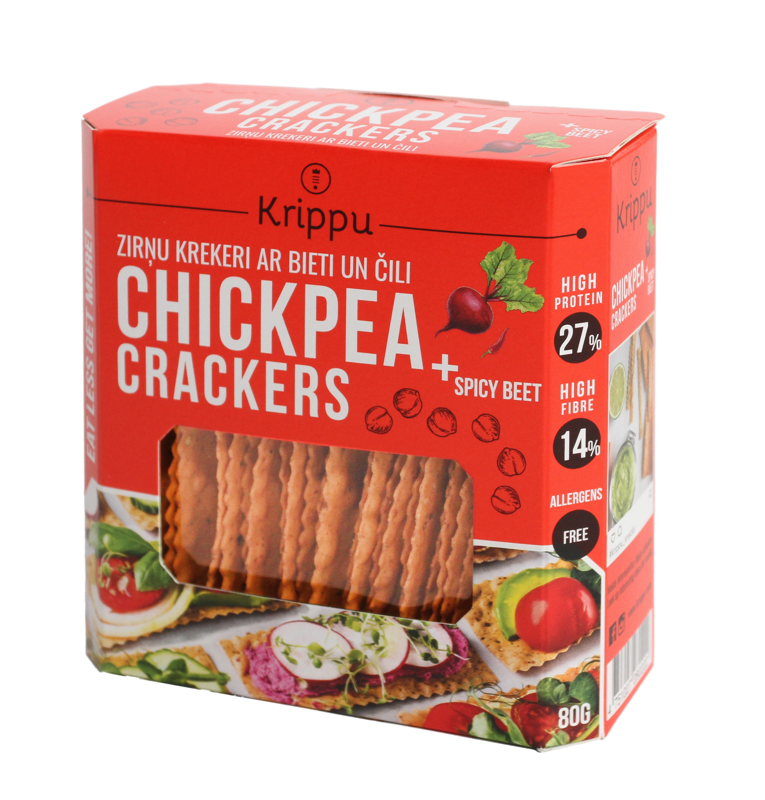 Those who love more spicy taste can try "KRIPPU" crackers with spicy beet and get high protein 27% and fibre 14%. Crackers are free from allergens. 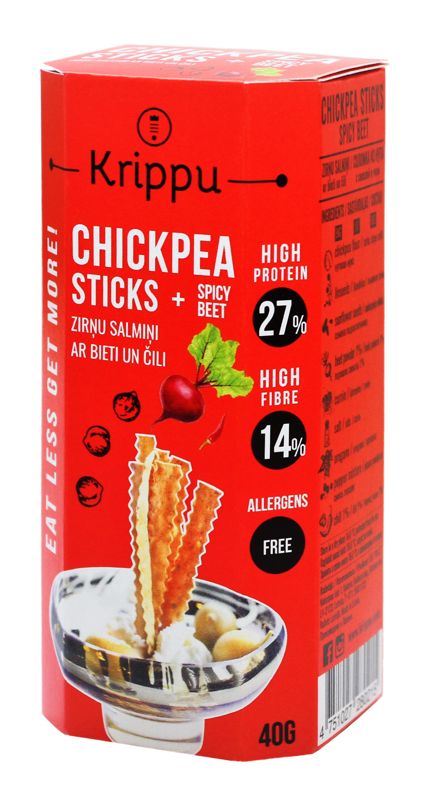 Ingredients: chickpea flour, linseed , sunflower seeds, beet powder 1%, cumin, salt, oregano, pepper mixture, chili 1%. Pick up a healthy snack with a touch of chili! Free from allergens. Ingredients: chickpea flour, linseed, sunflower seeds, beet powder 1%, cumin, salt, oregano, pepper mixture, chili 1%. Toasts with garlic have always been a favorite snack – now there is Krippu onion crackers without excess fat. 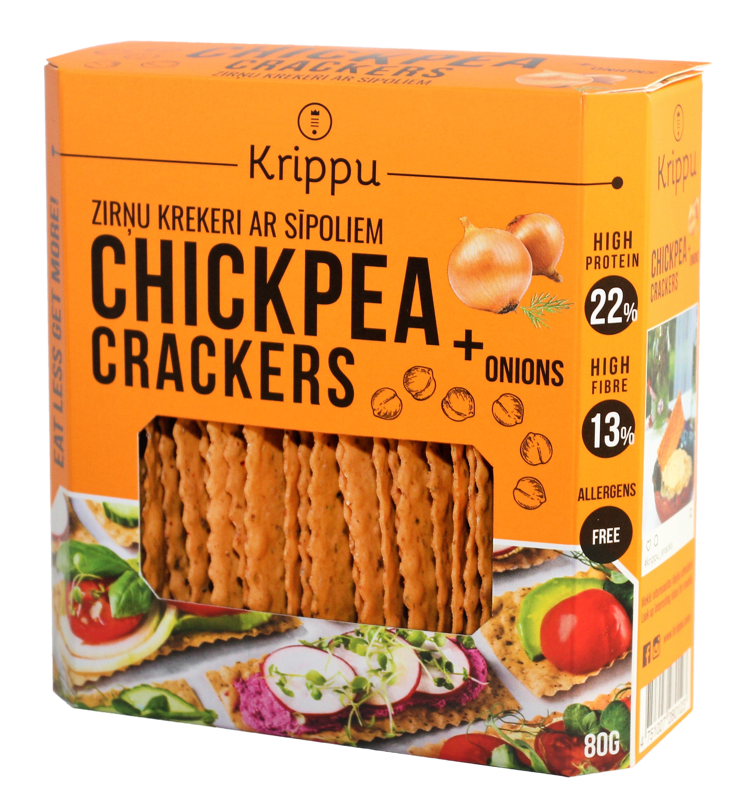 Krippu chickpeas crackers with onion have a pleasant onion taste, complemented by a rich spice bouquet. Onion crackers contain 22 % protein and 13 % fiber. In addition- after the Krippu onion crackers you will not smell like an onion yourself! Ingredients: chickpea flour, linseed, sunflower seeds, onion powder 3%, salt, pepper, dill, oregano, turmeric. 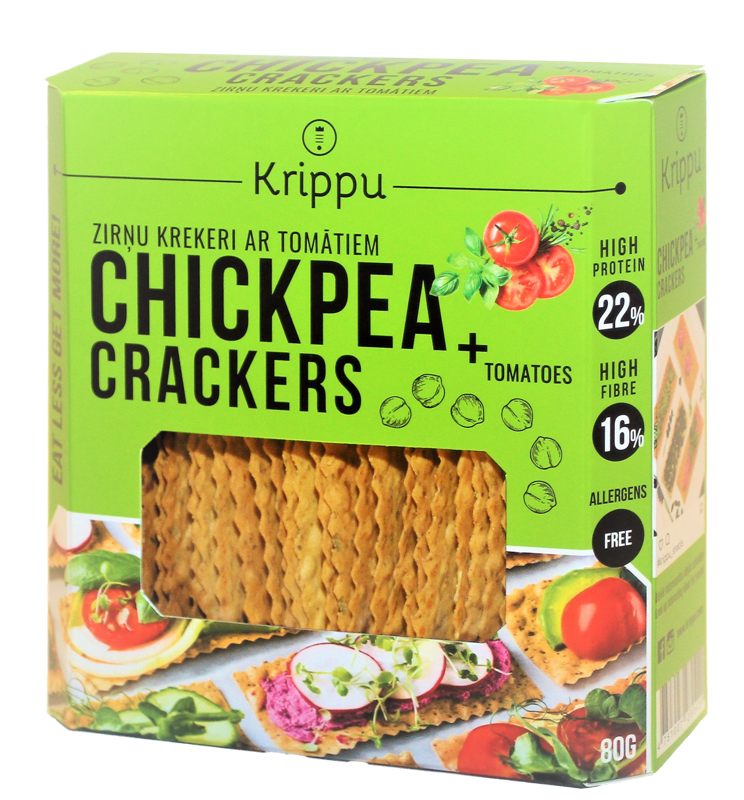 Krippu crackers with tomatoes are for gourmets who love dried tomato taste. Rich in taste so that they melts in the mouth. High protein 22% and rich in fiber 16%.